The Cutting Edge Jacket is a modern accompaniment to your wardrobe. It can reveals a rough refinement with raw edged denim accented with contrasting linear stitching detail on facings or a refined edging for a more sophisticated look. Shown here are facings featured in cotton or cut from the wrong side of denim. Jacket could even be constructed from repurposed denim jeans. Two lengths include a cropped mid hip length and a lower hip length. 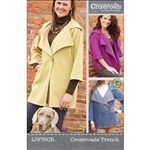 Included is an optional single raw edged pocket embellished with decorative stitching. Closure is provided by a single, oversized snap at neck. Sizes: S � XXL Try one of our denim or recycled fabrics for a great look! A beautiful lightweight denim with spandex making it very versatile in its use. 97% Cotton, 3% Spandex. 59" Wide. Beautiful white denim that has a small amount of stretch in it. 52" Wide. A beautiful black denim with stretch. The stretch gives the fabric a soft hand, and allows it to have a lovely drape to be utilized with it. 59" Wide. A quality designer brand fabric from Veronica Beard. This gorgeous Italian gray stretch denim has a soft hand, and great stretch for a demin piece. A hard piece to ignore especially for anyone interested in making stylish denim fashion. 91% Cotton, 6% Polyester, 3% Spandex. 51/52" Wide. A naturally colored stretch denim muslin fabric thats quite versatile for a variety of fashion projects you're working on. 92.5% Cotton, 6% Polyester, 2.5% Elastane. 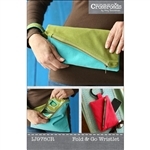 Whether running errands or out on the town, this folded wristlet will hold all of your necessities in style. Top closure features zipper or Velcro closure with hidden magnetic snaps to keep it folded. Create a custom bracelet or use a bracelet you already have. Construct your bag using a single color or mix it up with two coordinating colors. 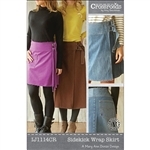 Suitable fabrics include Crossroads Denim or quilter�s cotton. Large: 10 1/2" H (5 1/2" H folded) x 10 1/2" W; Small: 9 1/2" H (5� H folded) x 8� W.